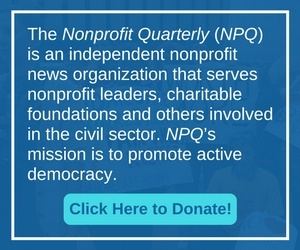 Click the cover image below to read and download the Spring 2011 digital issue of the Nonprofit Quarterly. This article is an important and timely must-read in that it addresses how nonprofit boards need to step to the plate differently when the political and economic environment is deeply chaotic. We know that for-profits and nonprofits are both enterprises in need of good strategic management, so what really is it that differentiates them? Does governance only reside in the board? Most of us know that it is more widely held than that, but few really design their governance systems to make full use of the intelligence and energies of their stakeholders. This article provides guidance and examples. Diversity on boards has to be good, right? So how is it that study after study suggests the opposite? A closer look at boards today reveals that exactly how we diversify makes all the difference. A very public furor ensues when a nonprofit organization awards its employees a year-end bonus. What is it that enables boards to be strong and effective? And why are we still using outdated models in an effort to improve board performance? David Renz gives us an overview of some of the best research on nonprofit boards and governance today. Have you been noticing any changes in your organization’s board? NPQ readers describe what they are experiencing as boards respond to the still roiling environment. A board member of two “competing” organizations has become privy to the disconcerting fact that one has takeover designs on the other.